RoomWizard Scheduler For Busy Offices | OhGizmo! If you work in a crowded office and find yourself battling for time in the meeting room, the RoomWizard will serve as a neutral electronic third-party. 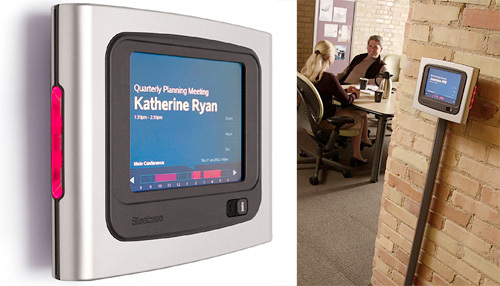 It’s a touch-screen display designed to be mounted outside a conference room that provides an easy way to either book the space for a meeting, or peruse the upcoming schedule. If you want to just drop in, a set of LEDs on the side switch between red and green indicating the room’s availability which should prevent you from looking like an idiot when you barge in on a meeting in progress. The RoomWizard can also be accessed from your work PC since it runs an internal webserver, and can even be synced with Lotus Notes or Microsoft Outlook servers. Over time it will even keep track of room occupancy and reservation patterns so you can see exactly how the shared spaces are being used. Official pricing for the RoomWizard seems hard to come by, but apparently the units cost over $2,000 each, which should bolster the sales of white boards and markers. Seems like a solution in search of a problem. Most offices will probably stick with shared meeting calendars on Exchange with the day’s schedule taped to the door of the conference room. Two thousand dollars per, oh, I’m loling. Hard. At the corporationn where I work in Oklahoma City, we have these same panels outside the conference rooms on all the floors of our office tower. They’re really handy, especially in regards to the always-in-demand, huge meeting rooms. We just reserve a room and a time on our corporate intranet home and you can also use the panel outside the room to see who has the room for what and when. we have these at my school and they are useless. they power and cat5 cable can both be unplugged from underneath to screw with reservations. there is also a power button underneath that can be pressed to screw with room reservations. my school has about 10 of them….and they are a useless. I think it still comes in very handy in schools till now. LOL I think someone is screwing them up, but I think these gadgets are quite handy to use.